Wilmington, NC: Three events held in Wilmington and its island beaches have been selected as Southeast Tourism Society [STS] Top 20 Events during the months of January through March, 2018. The North Carolina Jazz Festival makes a return appearance on the prestigious STS Top 20 Events list, as does the Coastal Living Show, both held in Wilmington. Making its debut in 2018 as a Top 20 Event is the U.S. Open Fat Bike Championship in Wrightsville Beach. These STS Top 20 winners exemplify the variety of annual events that take place in Wilmington and its island beaches during the winter shoulder season. The North Carolina Jazz Festival (Feb. 1-3, 2018) is one of the oldest traditional jazz festivals in the country. On Thursday evening, the special event concert “Styles of Jazz” features styles other than traditional jazz. Friday and Saturday evenings 15 all-star musicians from around the world will present more than four hours of traditional jazz both nights. This event brings attendees to Wilmington from across the U.S. (and beyond) for a weekend where the evenings are filled with jazz, but the days are free for exploring the local historical sites, beaches and golf courses, as well as shopping in galleries and shops and dining in the many fine restaurants. The cabaret-style evening performances take place in the ballroom of the Hilton Wilmington Riverside, 301 N. Water Street, Wilmington, N.C. Admission charge. For a schedule and to purchase tickets, visit ncjazzfestival.com. U.S. Open Beach Fat Bike Championship (March 17, 2018): Roll into fun at the only fat tire bicycle race that is held entirely on the beautiful sands of Wrightsville Beach, N.C. Competitors from all over the country vie for the title of champion of the U.S. Open Beach Fat Bike Championships in this annual event. While racers are looping the mile-long course, spectators are right along the path to cheer on the racers. Different obstacles are built on the morning of the event, which challenge the racers and thrill the crowd. It’s exciting to participate and fun to watch. Registration required for participants; free to spectate. The competition takes place on the beach, beginning at 12:00 p.m. until 5:00 p.m., behind the Blockade Runner Resort, 275 Waynick Blvd., Wrightsville Beach. For details, visit fatcross.com. Coastal Living Show 2018 (March 24, 2018): This year’s theme “Life on the Coast” will showcase a variety of gifts, products and services for the home, garden, and office—all with a seaside flair. Exhibitor demonstrations will cover topics such as healthy lifestyles and how to enhance time spent at home, whether it’s on the coast or elsewhere. Attendees will be inspired to spruce up their home, garden, office, entertainment collection, and personal wardrobes. Admission is free. All proceeds from the Coastal Living Show help local organizations that serve to improve the lives of women and children. This popular showcase takes place from 10:00 a.m. until 4:00 p.m. at the Wilmington Convention Center, 515 Nutt Street, Wilmington. For details, visit coastallivingshow.com. Stray off course and see where the water takes you when you visit Wilmington, North Carolina’s River District and the island beaches of Carolina Beach, Kure Beach, and Wrightsville Beach. 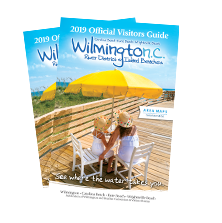 For a free Official Visitors Guide to Wilmington and its island beaches, call 1-866-266-9690 or email visit@wilmingtonandbeaches.com. Follow the links for seasonal highlights and specials and/or a complete calendar of events.